Cleanses the colon, liver and kidneys. Promotes the absorption of nutrients. Cleansing and detoxification of the body promote good health and general well-being. Herbs and nutritional supplements can be used to nourish and cleanse the body, especially the body systems that are heavily involved with metabolic processes. The digestive system feeds the entire body and must flow freely to ensure the efficient elimination of toxins from the body. The colon, in particular, must function properly to promote the elimination of waste materials from the body. The liver and kidneys are also important detoxifying organs. The liver aids in the digestive process by secreting bile that emulsifies fat, hence facilitating the actions of digestive enzymes and juices. The liver also controls the metabolism of various nutrients and serves as a reservoir for many of these nutrients. The kidneys act as a filtration system during the production of urine. 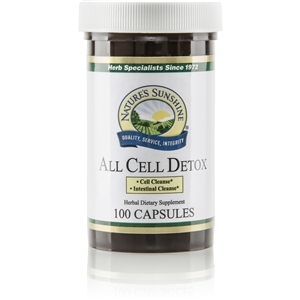 All Cell Detox contains herbs that help cleanse and detoxify these organs. NOTE:This product contains cascara sagrada. See your health care provider prior to use if:pregnant or nursing, any medical condition exists, or when taking any medication. Read and follow recommendation carefully. Do not use if diarrhea, loose stools or abdominal pain are present or develop. Not intended for prolonged use. Use of this product may worsen these conditions and be harmful to your health. Chronic diarrhea can result in serious illness.